Unsurprisingly, AT&T is continuing to actively pursue users who partake in unofficial tethering methods by means of a jailbreak. This isn’t really news though, we mentioned that AT&T was cracking down on unofficial tethering back in March, but nonetheless those who are still using apps like MyWi are continuing to get notifications from AT&T. Customers are being notified that their service plans need updating to subscribe to a tethering plan, and that they will be automatically subscribed to a DataPro 4GB package that costs $45 per month if they continue to tether. In the email, AT&T also notes that if customers discontinue the use of tethering, no changes will be made to their plan. This continues to to be true, but the efforts by AT&T only really effect jailbreakers who use apps like MyWi or PDANet and who still have the grandfathered unlimited data plans. Many users have been expressing frustration in our comments and elsewhere about AT&T’s decision to ditch unlimited data and to charge for tethering. Supposedly there are ways to prevent AT&T from detecting your tethering use, but ultimately it seems like a losing battle, so you should probably get used to paying for the service if you use it. Apologies if this sounds like Groundhog Day. I switched over the last round of texts. This almost doesn’t even matter since AT&T is issuing bandwidth caps anyway. “Unofficial”? WTH does that mean? In previous articles AT&T has tossed out words like “unauthorized” and “illegal”. NONE of these words are valid for many tetherers. My TOS(Terms of Service) agreement is from 2005 and there are absolutely NO restrictions on tethering my Iphone with my laptop. I also have not jailbroke my Iphone, but simply refused to update my software to their new and improved (tethering disabling) software and they are pissed. Lying to me on the phone, sending threatening letters. Standby for a class action lawsuit over BREACH OF CONTRACT. I’m sorry for those of you who can only get the new (tethering banned) unlimited contracts, but that doesn’t alleviate AT&T’s responsibility to fulfill their side of my contract, and doesn’t give you the right to attack our existing contracts. I’ve been a loyal AT&T customer paying $100 a month for several years now. They grandfathered me into the unlimited plan, I have my phone jailbroken so I can share data with my iPad. Note, that nearly all data aside from video or siri (higher bandwidth usage file types) use NO MORE DATA, than if you were to run the app on your iPhone. This is simply AT&T squeezing us for another $20 a month for data we already pay for. It’s price gouging and no one should stand for it. They’ll lose me faster over that $20 increase, than the near idiocy of a $100 per month bill. The girl that I spoke with about this was reading from a script – that made me pretty confident. What makes me mad is that they’re going to have the F’in nerve to tell me that if I keep tethering they will auto upgrade me. But even if I stop and use only my phone they’re STILL going to slow my service down after 3gigs. TF? If they keep BS’in sprint is about to have ALL their customers! If we have a grandfather plan we should have a grandfather TOS. 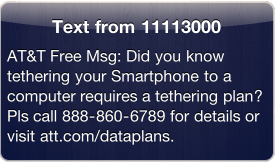 It didn’t ban tethering, so them adding new ish isn’t that a breech of contract?